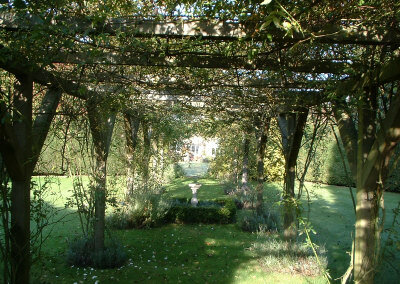 We think that this Pergola looks very attractive with its climbing roses. It is the show piece of a central garden bordered by an evergreen hedge. Providing shade in summer and shelter for birds in winter. To construct a pergola like this one would take us about 3 days. The roses need around 3 years to really get established and the life expectancy of this structure is 25 years plus.